Owner Dave Couper is a Licensed Master Electrician with over 30 years of experience. 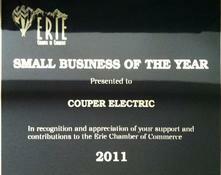 Couper Electric is family owned and operated in Erie Colorado. We provide expert electrical service to Boulder and Broomfield Counties and other Front Range communities. We do all phases of commercial and residential work. Couper Electric is an A+ rated Accredited Business of the Better Business Bureau serving Denver/Boulder and a member of the Erie Chamber Of Commerce. Please feel free to check over our report now available online.